In a joint, pannus is defined as abnormally thickened synovial tissue (also referred to as synovium or the lining of the joint) that covers articular cartilage, the type of cartilage found in the joints. As synovium thickens and proliferates, the joint actually fills with synovium and the abnormal synovium migrates across the articular cartilage, eventually producing erosions. In rheumatoid arthritis, the erosions typically begin at the margin of the joint. As pannus progresses, it can invade the bone and bone marrow, and destroy surrounding structures, such as the joint capsule and tendons. Not much is known about the behavior of pannus in osteoarthritis compared to pannus in rheumatoid arthritis. Researchers did a study for the purpose of comparing osteoarthritis pannus with rheumatoid arthritis pannus in vitro (in the lab environment) in 2008. Results published in Clinical and Experimental Rheumatology found similarities between osteoarthritis and rheumatoid arthritis pannus—but why osteoarthritis pannus invades the cartilage surface but does not cause marginal erosions that are typically seen in rheumatoid arthritis was not explained. In the study, pannus and synovial tissue were obtained from 5 osteoarthritis patients and 5 rheumatoid arthritis patients during arthroplasty (joint replacement), then were cultured and studied. Pannus was defined by the study authors as "microscopic invasive granulation tissue covering the articular surface". All of the study subjects had vascular and fibrous pannus. Synovial proliferation infiltrates from inflammation, and a decrease in extracellular matrix proteins was observed from the tissue samples that were obtained. Chondrocyte proliferation was less in osteoarthritis cartilage than rheumatoid arthritis cartilage. Osteoarthritis synovial tissue had lower levels of proteoglycans than rheumatoid arthritis synovial tissue. Type II collagen levels were also lower in osteoarthritis cartilage than rheumatoid arthritis cartilage. Much higher levels of interleukin-1-beta were associated with rheumatoid arthritis pannus compared to osteoarthritis pannus. High levels of TNF-alpha, IL8, and TIMP-1 were associated with both osteoarthritis and rheumatoid arthritis pannus. It was concluded that rheumatoid arthritis and osteoarthritis pannus have similar pro-inflammatory and anti-inflammatory cytokine expression. Why osteoarthritis pannus does not cause marginal erosions like rheumatoid arthritis remains unknown. Aside from pannus of the joints that occurs in osteoarthritis and rheumatoid arthritis, pannus can form in other places, such as over the cornea, or on a prosthetic heart valve. As pannus grows, it may appear tumor-like. Rheumatoid Arthritis: Survey in MRI Features in Musculoskeletal System. Hong Kong Journal of Radiology. Munk et al. 2002;5:63-68. 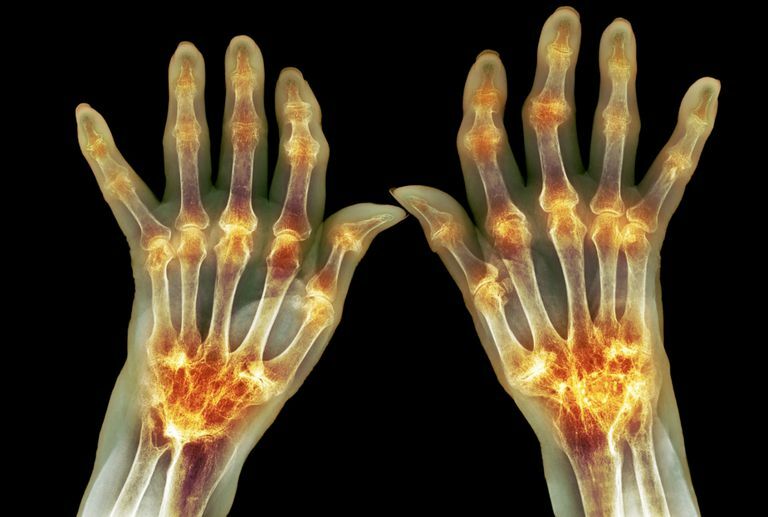 Osteoarthritis and rheumatoid arthritis pannus have similar qualitative metabolic characteristics and pro-inflammatory cytokine response. Furuzawa-Carballeda J. et al. Clinical and Experimental Rheumatology. 2008 Jul-Aug;26(4):554-60. RA Pathophysiology. Arthritis Information. Johns Hopkins. September 24, 2013.